You know when you get this idea and you think I REALLY want to do this. I had this idea and I do like challenges bbuuutttt.........Dagnabit this is tryin my calm. HAHA First let me say to all those who knit or crochet with thread I applaud you! Thread is soo small and depending on what color you use it can become hard to see. But with the help of a unicorn movie, a good led light and a pair magnifying glasses I was able to crochet the multicolor doily!! The other one in black was one of my first tries. Its wonky but I think it has its place here as well and I'll add it to the sewing room. Maybe half sticking out of a drawer or in a pile. I like my wonky stuff and each one has a special place. Now if I can only make about 50 more doilies in the same size and not wonky I can attach them and have a blanket. I think this will call for more movies and maybe chocolate! If not I'll just have lots and lots of doilies. Do any of you use doilies in your mini scenes? Then I got an award from Illyria. Thank you soo much lady. So to follow the rules here are bloggers under 200 that I like to read and or have bookmarked for reference and inspiration. I sympathize with ya Jenny! I would love to learn how to knit in mini! Oh, imagine the possibilities! Mini afghans, hats, sweaters! The only problem? I have a fule size knitted scarf that is almost done but I started about two years ago! Probably earlier than that actually! Maybe I'll work on it this winter :P As for crochet...nope...not willing to go there. Good luck...keep us updated on your progress! I made 4 small oven mitts to my miniature kitchen. I crochet also in thin thin thread, I sat near the window to get enough light. I also have great respect for all those who can make dresses etc. in that thin thread. You have done a gret job, so keep up the good work and make a beautiful carpet. Good luck. Congratulations on your award. Awesome looking! I love the rainbow colors how they meld. 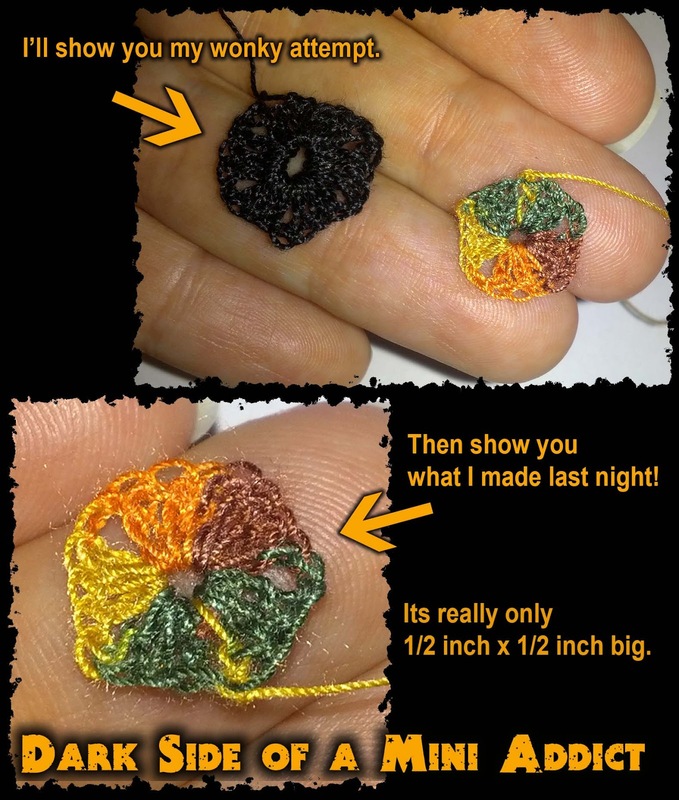 I applaud you, since I wont EVER crochet, I can barely sew with a needle. 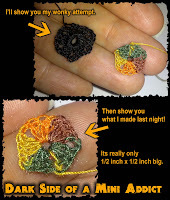 Your crochet work is so tiny, I think it is fantastic you even started with it, my compliments :D!! It's a fun challenge and I like those. My mom ha she even goes further and spins her own yarn. I can only imagine how long it takes to make all those wonderful mini knitted/crochet items, but with more practice I will get there. My goal is a blanket for the couch. Thanks Ilona, I think YouTube is really the blame! The video tutorials people put out there really helped then I just made it smaller.